Two young girls sneak onto the grounds of a hospital, where they find a disturbing moment of silence in a rose garden. A couple grows a plant that blooms underground, invisibly, to their long-time neighbor's consternation. A cat worries about its sleepwalking owner, who receives a mysterious visitor while he's asleep. After a ten-year absence, a young man visits his uncle, on the twenty-fourth floor of a high-rise that is floating in the air, while his ugly cousin hesitates on the stairs . . .
Can Xue is a master of the dreamscape, crafting stories that inhabit the space where fantasy and reality, time and timelessness, the quotidian and the extraordinary, meet. 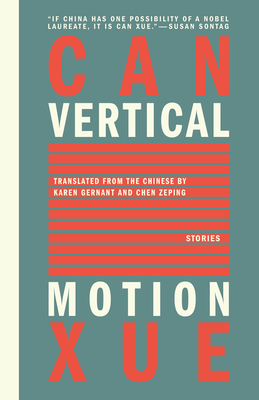 The stories in this striking and lyrical new collection--populated by old married couples, children, cats, and nosy neighbors, the entire menagerie of the everyday--reaffirm Can Xue's reputation as one of the most innovative Chinese writers in a generation. Can Xue is a pseudonym meaning "dirty snow, leftover snow." She learned English on her own and has written books on Borges, Shakespeare, and Dante. Her publications in English include, The Embroidered Shoes, Five Spice Street, and Blue Light in the Sky, among others. Chen Zeping is a professor of Chinese linguistics at Fujian Teachers' University, and has collaborated with Karen Gernant on more than ten translations. Can Xue is a pseudonym meaning "dirty snow, leftover snow." She learned English on her own and has written books on Borges, Shakespeare, and Dante. Her publications in English include, The Embroidered Shoes, Five Spice Street, and Blue Light in the Sky, among others.Karen Gernant is a professor emerita of Chinese history at Southern Oregon University. She translates in collaboration with Chen Zeping.Chen Zeping is a professor of Chinese linguistics at Fujian Teachers' University, and has collaborated with Karen Gernant on more than ten translations.